Note: when I first tried to publish this post, half of it disappeared and I had to rewrite it. So if you read the first, abbreviated version, you may want to read it again, so it makes more sense. 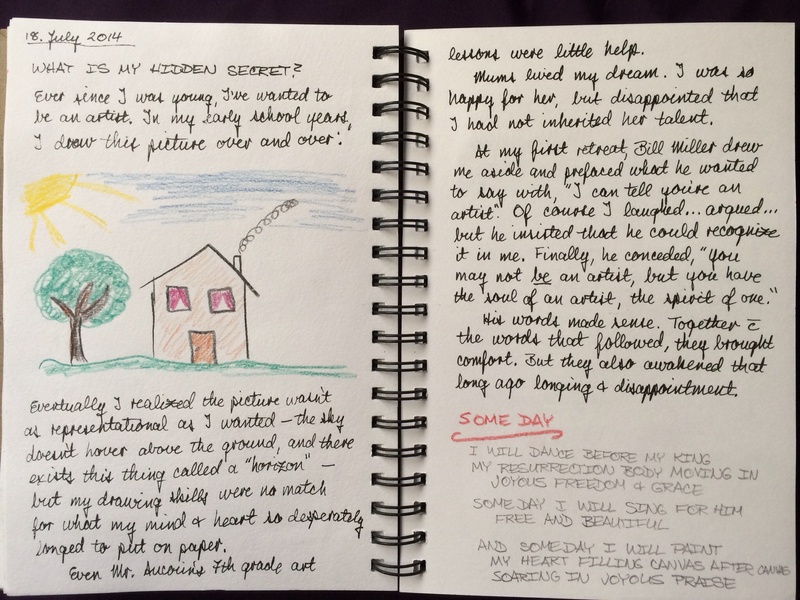 As I mentioned in my “Journaling Confessions” post, I’ve been adopting a somewhat different approach — at least for me — to my practice of hopefully therapeutic journaling. I also mentioned the prompt, “What is my hidden secret?” and posted my first response to that. After the session, I started reading a book I recently got, Drawing from the Heart by Barbara Ganim. Inspired by what she wrote about creating images to express emotions, I decided to answer the “What is my hidden secret?” question again. I had been sitting at the park, trying to relax, doodling, and eating a brunch that I’d packed, and trying to ignore an unsettling feeling that had been growing in intensity. What a great opportunity to put what I’ve been reading into practice! 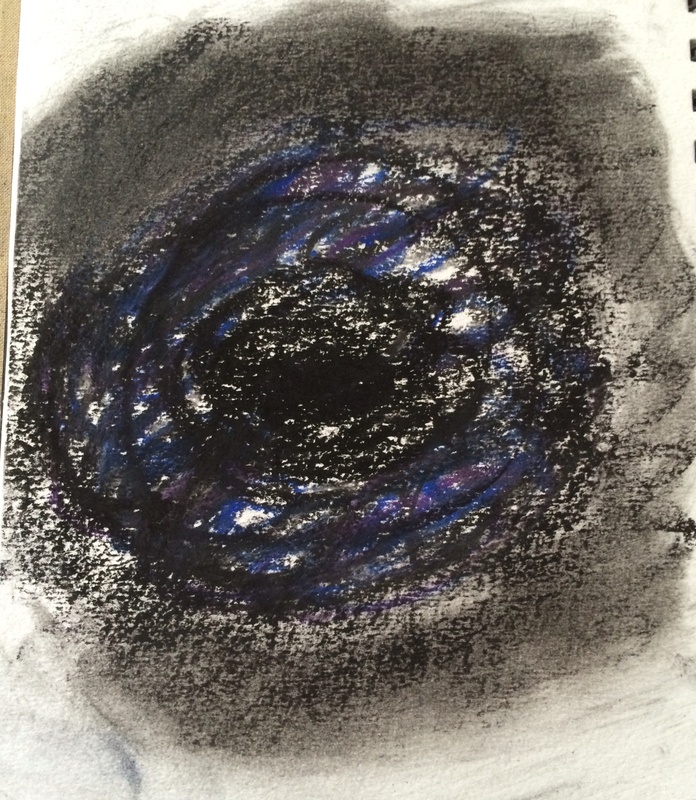 But then I quickly remembered that Drawing from the Heart emphasizes feeling, rather than thinking, so I stopped being analytical, got in touch with what I was feeling, and used that emotion and what felt like random impulse to choose chalk pastels as my medium, as well as to choose mostly black and a few other dark colors. This is the messy scribble I produced. After I was finished, I wrote this. OK, that’s hardly a hidden secret — pretty much everyone knows I’m a big huge chicken about almost everything. This is how the worst of my fear feels. It’s all dark and cold and confusing and jumbled up. I can’t see anything, can’t make sense of anything, can’t find my way. 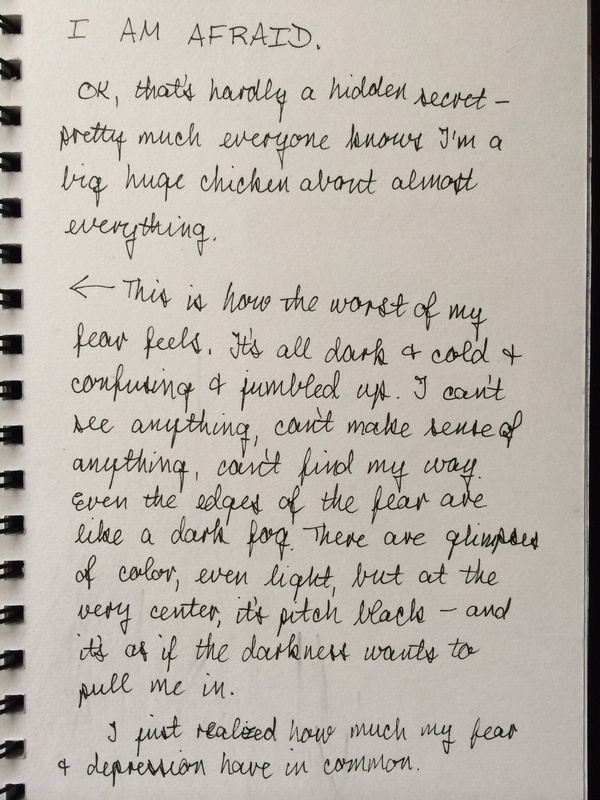 Even the edges of the fear are like a dark fog. There are glimpses of color, even light, but at the very center, it’s pitch black — and it’s as if the darkness want to pull me in. I just realized how much my fear and depression have in common. This whole process still strikes me as odd. Drawing from the Heart makes the rather bold claim that the sort of scribbling I did can actually help someone heal from trauma. Obviously I was intrigued enough to buy the book, and to try to “draw” an emotion. But I was also skeptical. The funny thing is that, despite thinking the whole idea was a bit goofy, I couldn’t help notice that my sense of fear drifted away, as if by capturing its darkness on the piece of paper, I’d made it powerless to torment me. It seemed so insignificant, a messy scribble on a picnic table, out of place on such a beautiful and sunny day. The other thing that surprised me is the realization of how similar my worst bouts of fear and my worst bouts of depression are. I think I would “draw” both pretty much the same way. When I was finished, that was my first thought: Wow, this looks just like depression! Some time in the future I want to draw what it’s like to emerge from the darkness of fear and/or depression, but now I’m curious enough about Drawing from the Heart to want to try the seven week program. At any rate, I’m planning to do “Step One” tomorrow morning. This entry was posted in My Story, Sexual Abuse and Recovery and tagged Journaling, Recovery by rrprewett. Bookmark the permalink.